There is a new Mayor and Council Member taking their spot at the Council Chambers. Scott Singer and Andy Thomson both won their races after a special election was held on Tuesday, August 28 to fill the Mayoral spot left by Susan Haynie who is still suspended by Governor Rick Scott. Deputy Mayor Scott Singer took over as mayor and decided to run for the seat in the special election, leaving his Seat A open for the taking. Kathy Cottrell, Tamara McKee, and Andy Thomson all filled to earn the votes for Seat A, and after 72 hours since poll closed, Thomson was declared the winner after a manual count was done on Friday morning. In the final tally, Thomson earned 7,927 votes, Cottrell earned 7,897, and McKee came in third with 2,133 votes. In the Mayoral race, Scott Singer defeated Al Zucaro and Bernie Korn by earning 11,801 of the total 18,622 votes cast for Mayor. 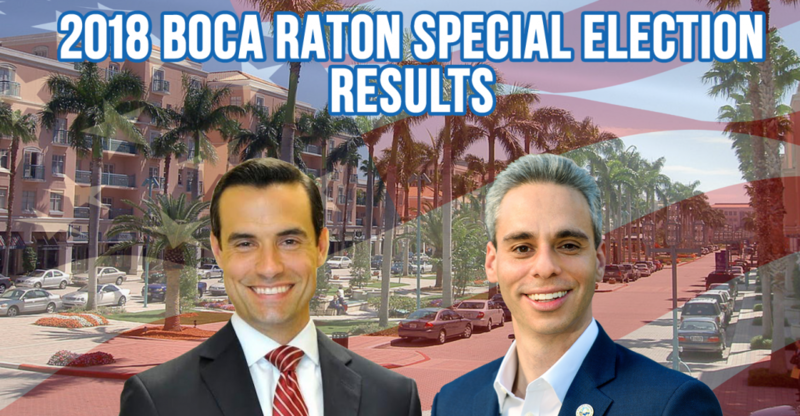 With 63.37 percent of the votes, Singer will officially take over as Mayor of Boca Raton and will finish out the term of suspended Susan Haynie.